To keep the focus on ministry, breaking through with the love of Christ, then you, as a church leader, need to get to the real essence of the Church. You need to break through the barrier of tradition and methodology and look at God's intent. Your ministry as a church leader isn't to be an efficient administrator or dynamic leader with all the bells and whistles. Rather, you are to lead the church to be the Church, one that helps followers of Jesus Christ function within . . . The above should be your guiding principles in leadership. 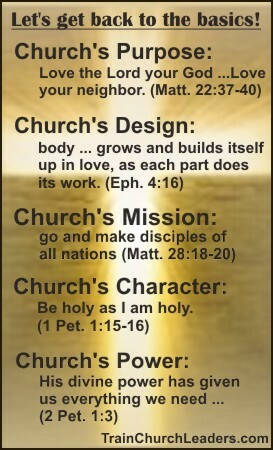 When you lead with these objectives, you will be breaking through with the love of Christ. The greatest contribution you will have to give to people is Jesus, not exciting programs, great facilities, or the latest technology. Programs, facilities, and technology will merely be tools, not the main attraction.